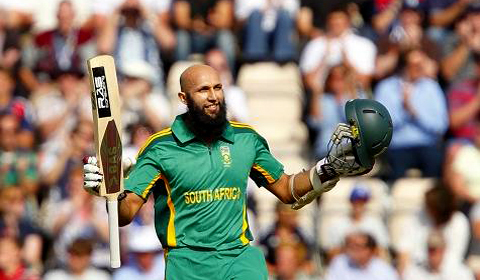 South African batsman Hashim Amla has become the fastest cricketer to record 3000 ODI runs after his outstanding innings of 150 against England during the second ODI at the Ageas Bowl in Southampton. Amla reached the milestone in just 57 innings, compared to West Indies legendary batsman Sir Vivian Richards, who is now second on the list at 69 innings. Amla is now the third South African player to accomplish the feat, with the other two being current South Africa coach Gary Kirsten and Boeta Dippenaar. This entry was posted in Uncategorized and tagged 3000 ODI runs, 57 innings, Boeta Dippenaar, Brian Lara, cricket, England, fastest cricketer, Gary Kirsten, Gordon Greenidge, Graham Gooch, Hashim Amla, Kevin Pietersen, milestone, Navjot Singh Sidhu, Sir Vivian Richards, South Africa, Virat Kohli. Bookmark the permalink.